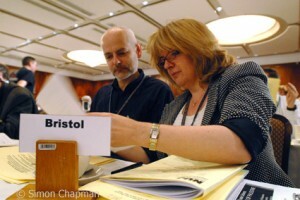 It’s Delegate Meeting time next month – the conference at which union members debate policy for the next 18 months. Several of us are going as Bristol Branch delegates, and we’d like to hear your views on any of the issues that will be discussed – including who has the right to become an NUJ member. I’ve bulleted a few of them below, but for the full agenda go to http://www.nuj.org.uk/files/Final2011.pdf. Joining the NUJ: Motion 127 says NUJ membership should be extended to anyone working for a media company, eg technical or support staff, or in media departments of any company – a radical proposal, but one which might allow the union to grow, and to become the union for all media workers. Health cuts: Late Notice Motion 6 condemns the Govt’s Health and Social Care Bill and points out that by abolishing many health bodies it restricts journalists’ opportunity to report on health matters. GOT ANY VIEWS? LET US KNOW!